Here's the list of children's and YA authors that are appearing at the National Book Festival this year. I would drive miles and miles just to hear Gantos. 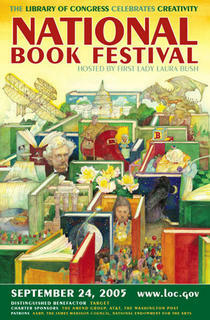 Jerry Pinkney created this year's poster. The festival is Saturday, Sept. 24, 2005, on the National Mall in Washington, D.C.
BookTV usually carries the festival but they tend to go for the politicians or David McCullough types. Hopefully they will share their cameras with some of these wonderful writers. Please, I can see Thomas Friedman or Andrea Mitchell on TV anytime. Man, I wish I could go. Looks like a lot of fun.